MUMBAI: India, a melting pot of multiple music forms, is known for its art and culture. While we have accepted foreign music with open arms, we are somewhere losing the glory of our own form of music. 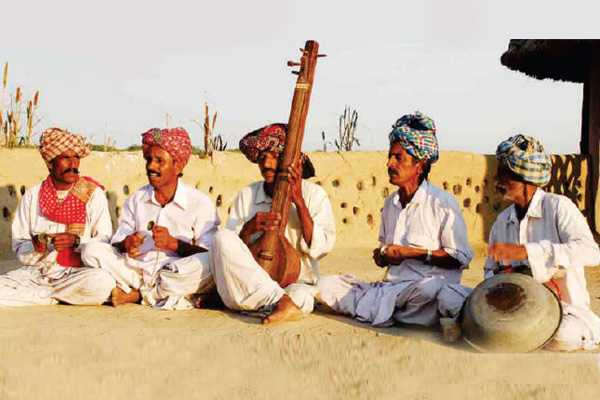 The folk music and musicians in remote areas are losing their way. One can never forget the scene from the movie Taal, where Anil Kapoor’s character steals music from farfetched Himachal Pradesh and sells it in Mumbai. The scene actually reflects reality. While fusion with folk music is considered to be cool and lauded for, original folk music and musicians are struggling to survive. Sadly enough, but glimpses of folk music is only seen in tunes created today. Therefore, Bhangra, giddha, Rajasthani folk music, Garba and fading visuals of lavani are known to the audience. However, a ticketed show to the live events is questionable. Though India is a unique place, with songs for every occasions and season, across the country, what stays afloat is pop music. One of the boons of digital media is that it has always brought to the fore, some lost art and the recent viral culture has made it even easier. With celebrity musicians tweeting and sharing about the unique talent in India, things can certainly change. Recently, Bollywood music composer, Shankar Mahadevan tweeted a video of one Kerala based man, singing a song from the bilingual movie, Vishwaroopam. Though a movie song, the encouraging highlight happens to be that a popular singer shared about a man from some remote village, who was singing regional music. The post was retweeted by the likes of Ustad Zakir Hussain. Also, apart from Shankar Mahadevan, a lot of artists from the South Industry have connected with Rakesh, the singer in the video. They also expressed a desire to work with him. While certain forms of music and musicians are almost fading away due to lack of audience for it and hence a revival for the same is essential. Therefore, more and more of such instances, where hidden gems and already prevailing forms of music are brought to the forefront, are welcomed. Baul sangeet is a rare form of folk music hailing from Bengal. The purists always complain that the original sound and music is lost in the noise. The neutrals believe there is only good music and then there is bad music. However, it’s the community of music lovers that keeps each and every form of music buzzing. MUMBAI: A huge buzz about the #MKBKSH campaign been hogging a lot of attention in the entertainment industry and has got the deserved attention it needs. There have been many actors from the Bollywood music industry like Kareena Kapoor, Vidya Balan, Farhan Akhtar, and many others. MUMBAI: Sula Fest, the country’s most gorgeously-situated, gourmet world music festival, went several notches higher in its twelfth edition this year. MUMBAI: Singer and music composer Shankar Mahadevan has shouted loud about the importance of teaching Indian music in schools. He also brought to notice, how western is being taught in many schools in the country. MUMBAI: Khatija Rahman, the daughter of Oscar-winning Indian music director A.R. Rahman, says that she is proud of her father not only because of his musical achievements worldwide but also about the values he has inculcated in her as a father. MUMBAI: Arpita Chakraborty, one of the singers of the recreated version of the hit disco song Paisa Yeh Paisa, loves remakes and feels this trend is the best way to revive melodies created by yesteryear's music directors and to make the songs more accessible to the youth today.